Call of Duty: Zombies 2 Average 0.00/5 - out of 0 total votes. 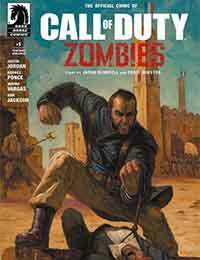 Meet the brand-new cast of characters from this year's Call of Duty: Zombies offering in this prequel! The year is 1910, the place is Morocco, and there is a job that needs doing. The man to do it? A commanding officer in the French Foreign Legion. The prize? An artifact of unspeakable power. The price? More than he bargained for. Barack the Barbarian: The Fall of Red Sarah!